Hyster & Yale recently announced an update to both the Hyster® Operator Sensing System (OSS) and Yale® Smart Operator Sensing System (OSS) for the E30-40HSD3 and ESC030-040AD truck models respectively. Here’s what’s stayed the same, what’s new and why this update will continue to help increase operator confidence and consistency. The patented OSS for both Hyster & Yale remains minimally invasive to the operator and continues to utilize 3 pairs of internally-mounted light emitters and collectors targeting the operator’s legs and truck entry point. The extent of applicable environments and operating conditions remain unchanged and the system is not adversely affected by fluorescent lights or sunlight. [Factory Default] – “Or” – Either right or left extremity in contact with applicable sensor beams during operation. [Left Extremity Only] – The left extremity in contact with applicable beam during operation. [Factory Default] – Regen and warning sound. *Qualified technicians can make adjustments to logic and egress via the field service tool to accommodate application requirements. With no raised pedals to stand on and more useable floor area than the competitors, the operator experiences increased freedom of movement during operation. Utilizing less mechanical parts than the leading competitors, both the Hyster OSS and Yale Smart OSS is easily serviceable and maintenance free. 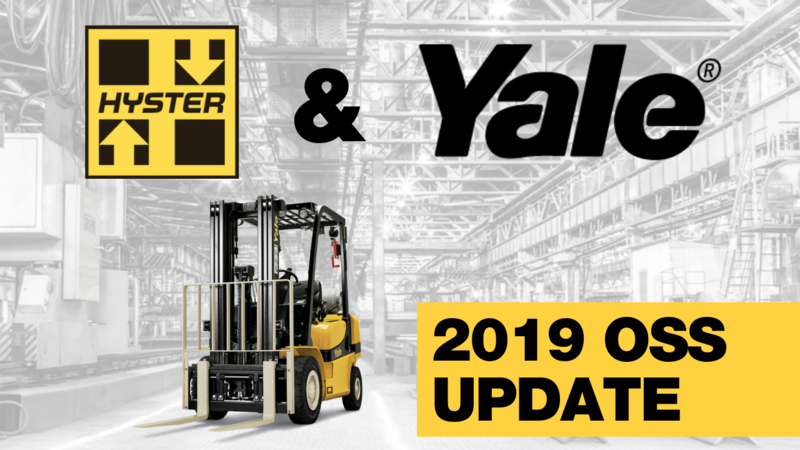 With updates like the ones mentioned above, Hyster & Yale showcases a dedication to improved mobility, versatility, and customization for improved efficiency and safety for operators. The updated Hyster Operator Sensing System will be installed automatically on all E30-40HSD3 units starting in April 2019 with serial numbers greater than C219N04330T, first shipments arriving in Q2 2019. The updated Yale Smart Operator Sensing System will be installed automatically on all ESC030-040AD units starting in April 2019 with serial numbers greater than C883N04596T first shipments arriving in Q2 2019. The new externally-mounted egress sensor option will interface automatically with NOVO and NOVO SPED price pages. Externally-mounted egress sensor increases truck length by approximately 2 inches. Standard rules for order changes apply. Interested in upgrading your maneuverability and productivity for increased throughput? Contact your local Papé Material Handling location today to see how these Hyster & Yale OSS updates can elevate your uptime. Introducing the Hyster® Power Match program with a dedicated Power Match team to help customers determine the best power solution based on their application and specific needs. These solutions are field tested to navigate the complexities of today’s power needs and implement a range of power sources from a variety of brands. Our Seattle Papé Rents location was proud to partner with Work of Honor to host a hiring event for veterans and military spouses on November 29. The new series of Yale forklift models makes attachment installation seamless and reduces the chance of operator error. The modified front end easily integrates with Bolzoni Auramo forklift attachments.